Mellieha, at the north end of Malta, is one of the best centres for walking on the island. Mellieha Town is quaint. Although there are a few hotels in the town, as it is perched on top of a steep hill, it does not get the hordes of holiday makers that visit its namesake bay to the north. The town is also easy to get to. A number 43, 44, or 45 bus will get you there from Valletta or St Paul’s Bay. 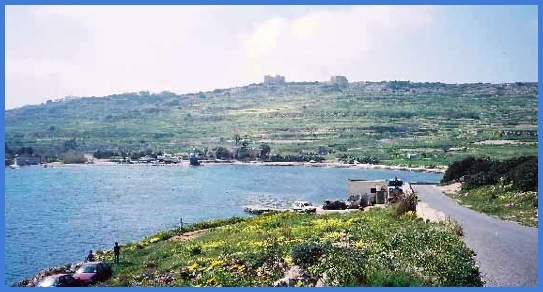 Mistra Bay with the Selmun Palace and Hotel on the hillside. Both were visited on these walks. The first time we visited the town we arrived there shortly after midday – we had spent the morning lazing in the sun at our hotel in St. Paul’s Bay. Needing something to eat we decided to try out George’s, one of the two bakeries that we found in the town. Here we purchased a loaf, which contained chopped onions, slices of olives and tuna. I suppose it was a Maltese equivalent of a Cornish Pasty and it was delicious. No wonder the Maltese are considered some of the best bread makers in the world. We also bought a cake containing almonds and citrus peel. Even more delicious. Mellieha Town, Selmun Palace, Ghajn Hadid WatchTower, Blata I-Bajda and Mistra Bay.